Cap and trade: Obama proposes bipartisan, market-based solution to climate change. 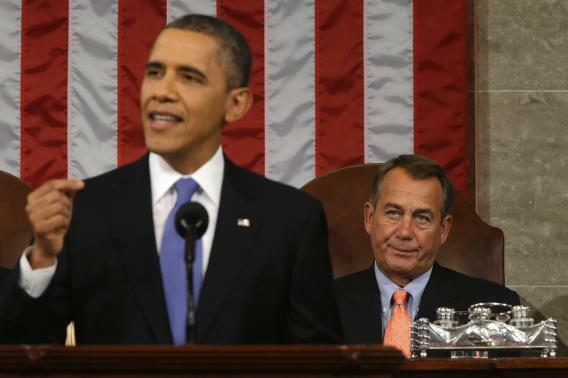 House Speaker John Boehner was not about to stand up and clap for cap-and-trade. I urge this Congress to pursue a bipartisan, market-based solution to climate change, like the one John McCain and Joe Lieberman worked on together a few years ago. But if Congress won’t act soon to protect future generations, I will. I will direct my Cabinet to come up with executive actions we can take, now and in the future, to reduce pollution, prepare our communities for the consequences of climate change, and speed the transition to more sustainable sources of energy. OK, so what’s a bipartisan, market-based solution to climate change? In a word, it’s fantasy: as long as the current crop of Republicans have a say in Congress, meaningful climate-change solutions are never going to emerge from that body. The sour look at McCain’s face as Obama mentioned his name shows just how far the senator’s party has regressed on this issue since his failed presidential bid in 2008. In three words, though, it’s cap-and-trade. Obama was referring to the Climate Stewardship Acts, a trio of Bush-era McCain-Lieberman bills that would have imposed limits on greenhouse gas emissions and allowed polluters to trade allowances and credits. That’s more convoluted than a carbon tax, which Democratic Sen. Barbara Boxer recently floated, and which would achieve similar ends. * But unless his reference to McCain was intended sheerly to embarrass his former rival, it seemed clear Obama was referring to cap-and-trade, perhaps because it does not have the word “tax” in its name. Regardless, it’s highly unlikely to pass, and Obama knows it—which is one reason he didn’t make the call with the kind of force he put behind, say, his call for a vote on gun-control measures at the end of his speech. It’s also why he followed up immediately with a promise to act if Congress doesn’t. So what exactly could Obama do in the absence of congressional support? More than you might think. In Slate recently, Paul Tullis listed 12 possibilities. The most potent of those, and perhaps the most controversial, would be using the Environmental Protection Agency to restrict emissions from existing power plants. Barring divine intervention on cap-and-trade legislation, that may be the biggest policy prize that environmentalists can hope for—at least until after the next killer hurricane. *Update, Feb. 13, 8:23 a.m.: This sentence has been edited for clarity.